The Community Bulletin Board is free and easy to take advantage of! You need an application which you can acquire from the City Clerk's office or the Information Technology department in City Hall. Fill it out, print it out, bring it to us! Requests will be submitted at least seven (7) days in advance, but no more than three (3) months prior to the event. Number of days message is displayed will be determined by staff based on number and size of other requests during the requested period, but usually no more than seven (7) days. No political advertising (exception: "Don't forget to vote"). No religious advertising (exception: No admission charge community Christmas programs; no admission charge community Halloween Carnivals, or alternative activities; no admission charge community wide concert in a public facility). "For profit" requests to advertise cultural and recreational events to be held at a public facility will be evaluated by staff. The City of Hobbs will have the right to refuse material deemed inappropriate to be viewed by the general public, i.e. any offensive content having sexual or violent statements. The City of Hobbs will make every effort possible to display the message as close to the times requested, but there is no guarantee as to the exact time when the message will appear. The City of Hobbs is not responsible for the accuracy of the content in each message. The City of Hobbs does not guarantee the number of times each message will appear during any particular period of time, as this is subject to many factors including number of messages at any one time. The City of Hobbs does not guarantee the exact number of viewer circulation. 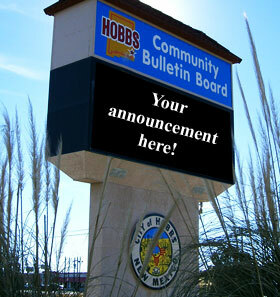 The City of Hobbs will have the right to edit each message to fit on the Bulletin Board and to use whatever format is necessary to display the message correctly (large or small text, etc).